6:00 P.M. DOORS OPEN FOR CHECK-IN AND THE LIVE MUSIC STARTS6:30 P.M. TO 8:30 P.M. DINNER BUFFET8:00 P.M. TOAST – CELEBRATING VISITATION10:00 P.M. REVERSE DRAWING ENDS!11:00 P.M. GOOD NIGHT TO ALL! THANKS TO YOU GENEROSITY AND ENTHUSIASM, WE HAVE SOLD OUT THE EVENT. ​NO TICKETS WILL BE AVAILABLE AT THE DOOR. We still may have some raffle tickets available at the event. Be sure to ask if you haven’t purchased one yet! Come join us as we celebrate our history and honor Fr. O'Grady for his many years of service and dedication to the Visitation School and Parish community. 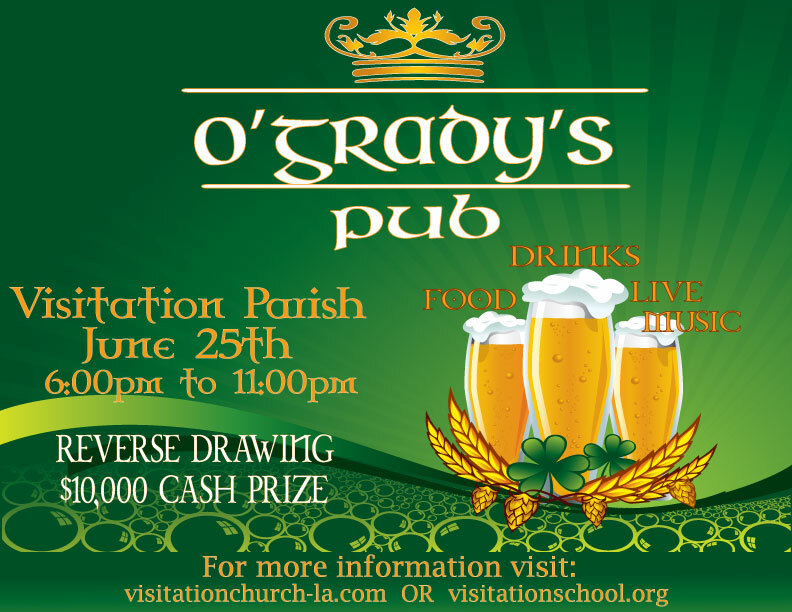 All proceeds benefit Visitation School & Parish. Thank you for your support!